Come Join the Fight to Protect Earth! 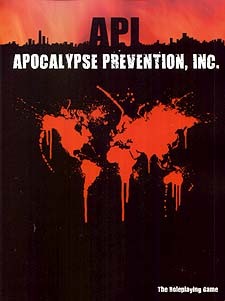 Apocalypse Prevention, Inc. has acted in the shadows, protecting humanity and the Earth from supernatural threats since the Black Plague. They have their hands in almost every facet of human life and have personally stopped the world from ending more times than one would guess. With their technological advancements and pacts with demon races, they equip their agents with the tools they need to fight against the End Times. The supernatural world is filled with magic, demons, and cybernetics, but their existence is unknown to the everyday person. That is API's job after all. Come join the fight to protect Earth!